Clea DuVall has been in front of the camera for almost 20 years. She captured the attention (and hearts) of every teen who didn’t feel normal enough in She’s All That, Can’t Hardly Wait, and The Faculty, and maintained that always-captivating presence on the periphery in movies like Girl Interrupted, Identity, and the 2012 Oscar winner for Best Picture, Argo. In the most recent season of HBO’s Veep, she stole scene after scene as a Secret Service agent of (very) few words who falls in love with the first daughter. But Friday marks the beginning of a new stage in DuVall’s 20-year career. She wrote, directed, and stars in The Intervention, an ensemble comedy out this week about six people who come together for a weekend in Savannah with the hopes of convincing their unhappily married friends that they should get a divorce. It’s a small movie that rarely ventures beyond the either the grounds of the gorgeous Savannah mansion where it was filmed or its audience’s expectations, but there is a deep, affecting sincerity in the relationships of its central characters (Melanie Lynskey and Cobie Smulders are the standouts here) that helps you forget that you may have seen it all before—as well as the fact that most everyone’s white. I spoke with Duvall on the phone earlier this week. An edited version of our chat is below. JEZEBEL: Hello! I was able to watch the movie a couple of weeks ago in the comfort of my home, so that was nice. I really liked it. So when did you write the movie, and how long was the process? 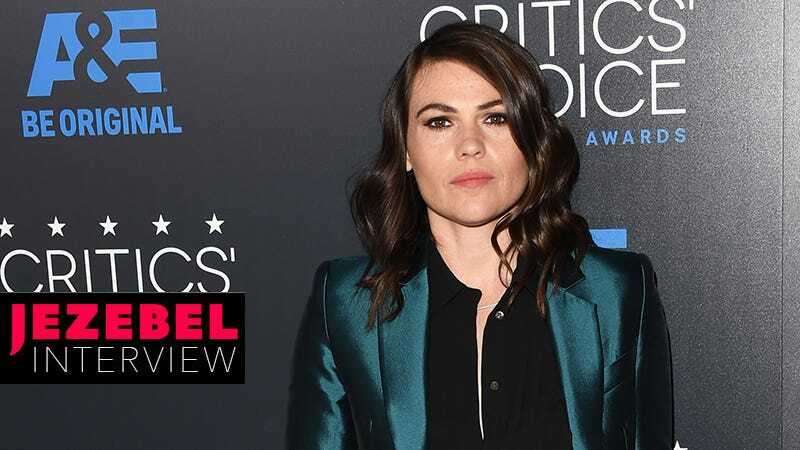 CLEA DUVALL: I wrote the first draft of the script around four years ago, then rewrote it for a couple years, you know, kind of putting it down and picking it up. I wanted to find someone else to direct it, but I wasn’t really active in trying to make that happen, and then having experience on a film where I had to do more than what actors normally do, that gave me the confidence to decide to take the movie on to direct it myself. Then, from there, within five to six months we had the financing and then we were shooting. It all happened really fast. How did the cast start coming together? Did you have Melanie Lynsky and Natasha Lyonne in mind from the start since you’d worked with them before? Well, I wrote the movie for Melanie. I wrote parts for myself and for Melanie from the very start, and then after the script was written, Alia [Shawkat] felt like the right person for that role. She was the only person I asked to do it, and Natasha came on board, then Jason [Ritter]—they’re friends of mine. And further down the line we got Cobie [Smulders] and Ben [Schwartz] and Vincent [Piazza] involved. They had the same agents as actors who were already in the movie, and who were fans of the script. And they wanted to be a part of it. Did Melanie know you were writing a movie for her from the beginning or was it a surprise once you were finished? How did she react after reading it the first time? This is the first film you’ve made with both Melanie and Natasha since But I’m a Cheerleader, right? Did you know them before BIAC, or did you meet on set? I met both of them before. The summer before we did that, we did Detroit Rock City together. So I ended up meeting Melanie at a Kiss concert on Halloween before we made BIAC. (Laughs.) Where was the Kiss concert? At Dodger Stadium. It was really insane. A very fun night. Going back to the movie, everything about the setting—the house, specifically—is so beautiful. And Savannah is such a gorgeous city. When you were writing it, was Savannah the location you had in mind, or was that something that happened along the way? I wrote it for Savannah. I had been there once before and really just fell in love with it. I hadn’t been back, but it really made an impression on me. I think it’s so beautiful and has such an interesting energy. It’s gorgeous, but it also feels like there’s a lot going on underneath the surface, and I really liked that about it. And I knew that I didn’t want it to be New York or LA. I was reading another interview with you recently, and you were saying you’ve played gay characters in the past, but not one that you really identified with. Personally, as a gay person who’s seen a lot of movies, I understand how that feels to constantly look for the exact gay movie that represents you, but you can’t quite find it? I guess anyone in a sort of marginalized group is always looking for themselves onscreen more than the people who just sort of fit into the broader portrayals in movies. Was this the first movie you attempted writing to sort of, you know, fix that? To give yourself a voice? I’ve written things that are more about my experience? They weren’t very good. No one wants to read those. They’re terrible. (Laughs.) But this movie, you know, I wanted to make a movie with Melanie, and the idea of being able to make a movie with my best friend was really exciting. I was writing a movie for myself, and we were playing friends, and it’s supposed to feel very real. So it just felt very inauthentic to give myself a boyfriend. And boyfriend problems. It felt more honest. A lot of my friends are straight. And when it’s a bunch of couples, it’s a bunch of straight couples, and then me and my girlfriend. But it’s not a thing. It’s not like, Ugh. The gays are here. You know? It’s just, we’re all friends and it’s normal. I think that as much as there are more LGBTQ characters represented on television, it is still a lot of times a thing. Attention is called to it. It is, on some level, about that. And I wanted it to not be a thing. I don’t see that as much, the normalizing of it onscreen. Yeah, and with a lot of ensemble movies like this—when I’ve been reading about The Intervention—there are a lot of comparisons to The Big Chill and all those movies about old friends getting together in an enclosed space and the drama that ensues. But what I like about The Intervention so much is that, when I think of movies like that, I think of movies written by straight guys. And here is this familiar idea but written and directed by a woman with a different perspective. Were you thinking about this history of this sort of genre of movie when you were writing it? Was that always on your mind? I’m not sure I can think of another movie like this was written by a non-straight woman. I’m not sure I can think of that either! That’s a good point. I never thought of it that way! (Laughs.) I mean, I thought a lot about, yes, there are a lot of movies like this. I realize that. I knew I was gonna come up against that and that a lot of people were gonna say that. But I do feel like, now that you say it, there are a lot of white guys writing about this. And this is a little bit different. I wanted to tell a very simple story about people and relationships and the place I was at when I was writing it. That was such a huge part of what I was going through when I was writing it—examining the relationships in my life, examining my own behavior, and trying to be honest with myself about things that I hadn’t really dealt with before. And I tried to tell an authentic story. The people getting together in a house, it’s contained and I knew for my first movie I needed to make something that was more contained to prove to myself that I could make a movie, and hopefully make another one. I like the idea of a small movie about relationships. They did all feel like actual friends, and I think that’s something that’s always hard to get past. If a movie or a TV show is about friend, and you don’t buy them as actual friends, then it’s like, I don’t buy this at all. One of my favorite scenes is between you and Melanie, toward the beginning, when you two are smoking and drinking on the side of the house and quietly commenting on the other’s smoking and drinking. It was such a small, honest interaction. I have one more question before I let you go. Maybe this is just for me, but I wanted to ask it anyway. In movies like Can’t Hardly Wait and She’s All That, I don’t think—correct me if I’m wrong—but I don’t think the characters in either of those movies were explicitly labeled as gay. And I think to a certain audience, they just came across that way? And I think that’s why gay people remember those roles, as small as they are, really fondly. You were just there, this recognition that there’s a non-straight person in the movie and it’s not just some joke. How do you remember those roles being written in the scripts? Did you have details removed? Added? Well, those weren’t written as gay characters. It was nothing that we removed. Can’t Hardly Wait was one of the first things I did. I auditioned for a bigger part in the movie, and I didn’t get it. And then they wanted me to do that little part, which I was still psyched to do. And what I did was just what was scripted. They definitely became other just in that they were me. I’m not the stereotypical girl, I wasn’t the stereotypical teenager. And that really came through in those movies because I was a little bit weird. And other. And you didn’t really see that often because it’s all about beauty and perfection, and I was a little bit off and a little bit different. But those were the sort of characters I always gravitated towards in movies. You know, Lili Taylor in Say Anything. I was obsessed with her. (Laughs.) She was a little bit off. A little bit unhinged. But I loved her. The Intervention is in theaters and on VOD today.